Owe how I love my HotTop. I have been home roasting for a little over a year now. 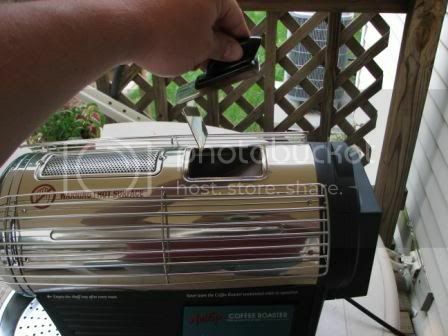 I started off with the home roasters first right of passage. 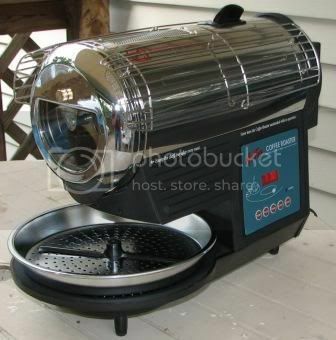 The hot air popcorn popper. After a month I was hooked, but as most roasters that start off this way, I quickly became frustrated with the small roasting batch. I also drink 99% espresso, the fast roasting of a fluid bed roaster (generic term for any roaster that uses a bed of hot air to roast) accentuates the acidity and brightness of a coffee. If you like a very lively espresso, that is ok, but I prefer a deeper bodied brew. So I decided to make my own roaster from a rotisserie roaster oven. 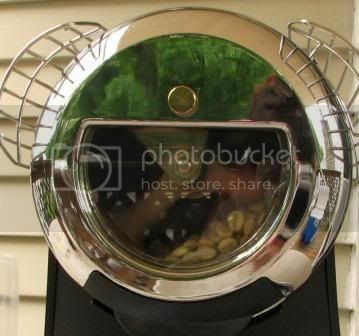 I added another heating element, built a stainless steel roasting drum and other modifications. That rig served me well for about a year. Having proven to myself that this was not a passing fad, I decided to drop the coin on a HotTop Digital roaster and join the big leagues (of home roasting). It is easy to use and reliable. Plug it in, push power; push the time button to set the roast time, push power to start. Once the machine finishes its preheat cycle, it beeps, lift the charging chute cover and pour in your green. Now you are roasting. Watch you roast develop through the window. Around and around the drum goes. I love watching the roast develop (this is a small batch). I use three queues in my roasting, smell, sound and sight. The aroma turns to a wet straw aroma as the greens begin their metamorphosis. 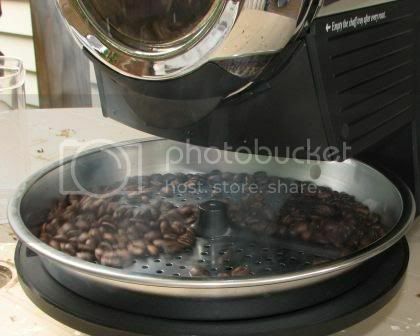 You see a light wispy steam rising from the machine as the beans heat and give up their moisture. As the roast progresses and the beans begin to yellow, the aroma changes to a nutty hint and the steam stops. As the beans increase in temperature and approach first crack, a light white smoke starts to rise. The aroma gets a deeper darker roasting aroma and the nuttiness dissipates. Then the magic first crack, POP! The beans have reached their first major milestone. The first crack is easily heard on the HotTop, like popcorn in a kettle, it is very distinctive. As that subsides we are in the city roast stage. As the roast progresses the smoke increases in both volume and pungency. It develops into a light gray heavier smoke, second crack is almost here. Then you hear it, the snap, snap of the first stages of second crack. I usually hit the eject button at this point to dump the roast. Depending on the variety of bean, I occasionally let it go a bit longer until a steady snap, crackle is starting (Full City+). At this point the smoke is rolling out of the roaster. Push the button to dump the roast, or let the timer run out and the machine will dump the roast on its own. Into the cooler it goes, the stirrer stirs and the cooling fan kicks on. A few moments later and it is ready to go. Nothing says love like a half pound of freshly roasted coffee. 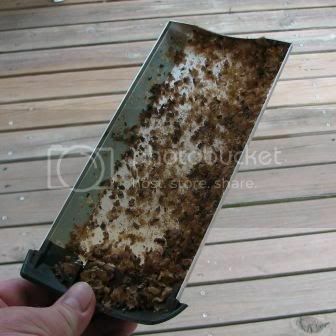 Don’t forget to empty the chaff tray after each roast unless you want to set the machine on fire! I just got a hottop too!